Facing its steepest revenue decline in 28 years, the restaurant industry has decided to appeal to its customers' baser instincts. Offering more and cheaper drink specials, extended happy hours, and all-you-can-drink promotions, eateries from Chili's to Morton's are moving to pull in customers with deals that often seem too good to be true. Conventional wisdom holds that sin stocks -- alcohol, tobacco, and gambling -- are recession-proof: that financial downturns lead consumers to drown their woes in a cocktail of stimulants, depressants, and other distractions. The truth is far more complex: sin stocks are resistant to economic downturns, but not immune. Consumers may drink more in hard times -- but they try to drink on the cheap. Lately, that's meant a shift from brand-name booze. While alcohol sales by volume increased by 1.5 percent between 2008 and 2009, liquor-store owners reported that their profit margin shrank as customers increasingly focused on non-premium brands. A second recessionary alcohol trend is that, beginning in 2007, more consumers began drinking at home instead of in restaurants. Last year saw a 2.2 percent drop in on-premises drinking, paired with a 2.9 percent increase in off-premises (or home) drinking. In 2009, estimates of the on-premises drop range as high as 10 percent. For restaurants, this has been devastating. Alcoholic beverages are less labor-intensive and require fewer ingredients than most food items, which makes their bottom line is cheaper. 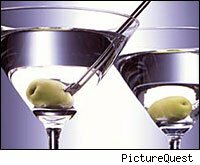 With the addition of a markup that is generally the same or more than comparably-priced menu items, the profit margins on cocktails hover around 30 percent -- roughly double that of food items. Alcohol consumption -- particularly in suburban and rural areas with less public transportation -- often inspires customers to linger in and order food, further increasing a restaurant's booze bonus. If an establishment can persuade customers to buy a couple of highballs, it can anticipate significant revenues from both the alcohol and from subsequent food sales. With this in mind, the move toward increased drink specials makes a great deal of sense. To begin with, researchers at the University of Florida and San Diego State University have determined that drink specials encourage customers to drink more than they normally would, which suggests that a narrower per drink profit margin can translate into equal or larger per-customer profits. Add in increased food sales as tipsy customers try to sober up, and the drink special bonus becomes a major recessionary factor. While economic improvement may spell the end of super-cheap recession drink specials, consumer changes in hard times sometimes linger long after finances improve. Cultural mainstays -- tacos, spaghetti, movie popcorn, soup -- all had their genesis in hard times, yet they're as popular as ever. With that in mind, once Bonefish Grill's $5 highballs and Chilis' $3.99 margaritas bring customers through the door, they'll probably win a permanent place on the menu.